Ask any senior involved with Jewish Life to reflect on their time at Georgetown, and they will say that the community has grown, Shabbat attendance has quadrupled in size, and programming is gaining more energy and enthusiasm with every year. To keep up with the Jewish community’s growth, Jewish Life has hired Benjamin Barer as the inaugural Dr. Robert Shattner Rabbinic Fellow. Barer is from Vancouver, Canada and comes to Georgetown as a fifth year seminary student at Hebrew College in Newton Centre, Massachusetts. He will be ordained this spring and will then be joining the Georgetown Jewish Life team full time. “Benjamin has all the promise that we saw in his application and interview process. His excellence is already evident in the beautiful work he has done in the community,” says Rabbi Rachel Gartner, Director of Jewish Life. 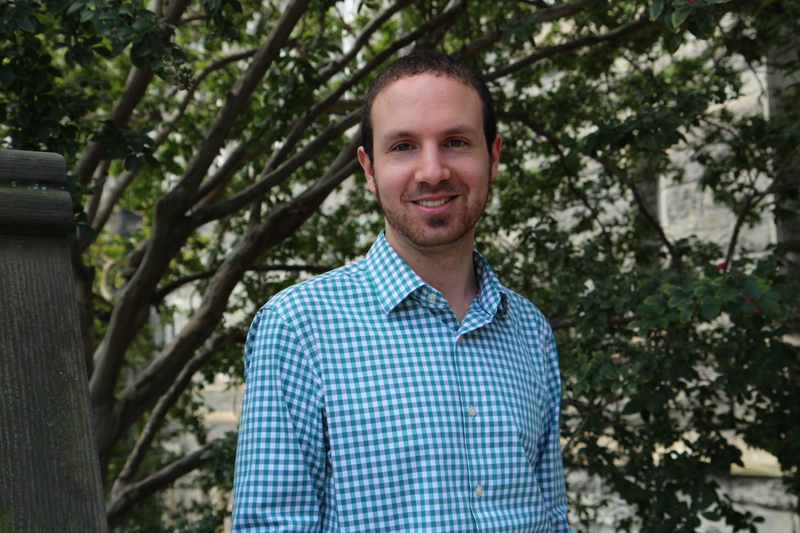 Our Jewish Life Engagement Professional, Ronit Zemel, sat down with Rabbinic Fellow Ben to ask him a few questions about his experience in the Georgetown Jewish community so far. How did you find out about the position? What excited you about it? Ultra-Orthodox yeshiva high school – and training in a pluralistic setting help me to connect with the wide range of student experiences of, and expectations for, Judaism. What has been the best part of the position since you got here? The best part of the job so far has been getting to know the students and sharing a little bit of myself through my teaching and seeing them connect to it. I think the highlight so far, in that vein, was my introduction to the community on Welcome Back Shabbat, where I was able to introduce myself through a drash that reflected on Charlottesville and Nazism. To know that that was both what I needed to reflect on and share, and what many of the students needed to hear, was humbling and emboldening at the same time. What are you most looking forward to in your time here? I am most looking forward to more of the same — deepening my relationships with students, staff, and faculty, both within the Jewish community and more broadly at Georgetown — and creating a community where we can learn and struggle together. This is long-term work, especially as the students are being pulled in so many directions. I know that there is a deep thirst for the spiritual meaning and relevance that Judaism can offer, and in time I know that I can help students find what they are looking for. Jewish Life at Georgetown is thrilled to have Rabbinic Fellow Ben as a part of our community, and we have already learned so much from his contributions. This entry was posted in News, Programs and tagged Jewish. Bookmark the permalink.